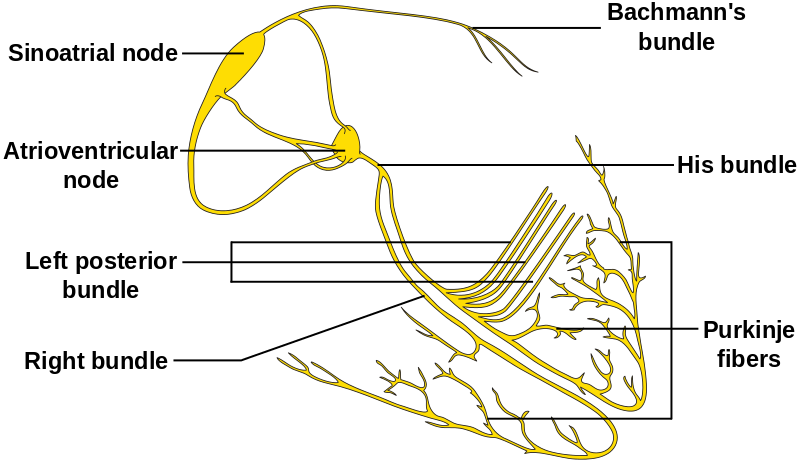 In the heart, electrical impulses are generated by specialised pacemaker cells and spread across the myocardium in order to produce a coordinated contraction in systole. The action potential generated is a characteristic disturbance of the potential difference between the inside and the outside of the cell. The particular action potential generated by cardiac pacemaker cells is very different to that in nerve and striated muscle cells, and to that of ventricular myocardial cells. In this article we shall consider cardiac pacemaker cells and the action potential they produce in more detail. Cardiac pacemaker cells are mostly found in the sinoatrial (SA) node, which is situated in the upper part of the wall of the right atrium. These cells have natural automaticity, meaning they can generate impulses themselves. Fig 1.0 – The conduction system of the heart. The atrioventricular (AV) node and the purkinje fibres also have cells capable of pacemaker activity, however their natural rate is much slower than the SA node, so they are normally overridden. The pacemaker potential occurs at the end of one action potential and just before the start of the next. It is the slow depolarisation of the pacemaker cells e.g. cells of the sinoatrial node, towards threshold. This is sometimes referred to as the ‘funny’ current, or If. The pacemaker potential is achieved by activation of HCN channels (hyper polarisation activated cyclic nucleotide gated channels). These allow Na+ entry into the cells, enabling slow depolarisation. These channels are activated at membrane potentials which are more negative than -50mV. Once the membrane potential has reached the threshold, an action potential can be fired. Once the HCN channels have brought the membrane potential to around -40mV, voltage gated calcium channels open. This allows an influx of Ca2+ which produces a faster rate of depolarisation to reach a positive membrane potential (responsible for the upstroke of the action potential). HCN channels start to inactivate. At the peak of the action potential, Ca2+ channels inactivate, and K+ channels open. This allows an efflux of K+ ions out of the cells. The membrane repolarises and this is seen as the downstroke of the action potential. Unlike the ventricular action potential, the opening of Ca2+ channels is not sustained, and there is no ‘plateau’ stage, hence the action potential is triangular in shape. After the action potential, repolarisation must occur and the membrane potential must reach negative values in order for the HCN channels to get reactivated again, enabling another action potential to be generated. Fig 2 – Diagram showing the action potential in cardiac pacemaker cells and the main ion movements at each stage. The autonomic nervous system (ANS) alters the slope of the pacemaker potential, in order to alter heart rate. Heart rate is affected by both the parasympathetic and sympathetic branches of the ANS, which innervate both the SA and AV nodes. Parasympathetic activity is mediated via acetylcholine acting on M2 muscarinic receptors at the SA node. This lengthens the interval between pacemaker potentials, hence slowing heart rate. Sympathetic activity is mediated via noradrenaline acting on B1 adrenoceptors. This shortens the interval between impulses by making the pacemaker potential steeper, hence increasing the heart rate. If all autonomic inputs are blocked, the intrinsic heart rate is about 100 beats per minute (bpm). The normal resting rate of about 60bpm is produced because the parasympathetic system dominates at rest, and initial increases in heart rate are brought about by reduction in parasympathetic outflow. Increasing sympathetic outflow makes further increases. Disturbance to the natural pacemaker activity of the heart can lead to arrhythmias i.e. a heartbeat with an irregular rate and/or rhythm. Ectopic Pacemaker Activity: This is when another area of the myocardium becomes spontaneously active and its depolarisations dominate over the SA node. A latent pacemaker region can become activated due to ischaemic damage. After-Depolarisations: This is when abnormal depolarisations follow the action potential – thought to be caused by high intracellular Ca2+. Re-entry loop: This occurs when the normal spread of excitation across the heart is disrupted due to a damaged area. When the conduction damage is incomplete it allows the impulse to spread the wrong way through the damaged area and create a circle of excitation. Multiple small re-entry loops can occur in the atria, leading to atrial fibrillation. Where are the pacemaker cells that normally control the heart rate located? Why does the heart normally follow the rhythm of the sino-atrial (SA) node above all other pacemakers? Which structure is not part of the conduction system of the heart? The movement of which ions are responsible for the pacemaker potential? Select the single best answer. The movement of which ion is responsible for the upstroke of the sino-atrial node (SAN) action potential?